Our weekly Pastry Post-Doc is coming a day early this year for Cinco de Mayo, a holiday celebrating Mexico’s victory over France in the 1862 Battle of Puebla. We are celebrating the holiday with a rare treat that is unique to Puebla: Molletes Dulces / Molletes Poblanos. Molletes in Mexico are usually a savory dish eaten as a snack or at breakfast, but in Puebla they are sweet, hence being called Molletes Dulces! Molletes in Puebla are are a sweet round bread (similar to a concha) filled with custard, often coconut-flavored, and covered in a pumpkin seed (pepita) icing. Contributing to their relatively unknown status, Molletes Poblanos are only found for a short period of time, from Father’s Day in June until August 12, the day of St. Clare of Assisi (Spanish link). If you are in Puebla, you can find them at bakeries on “Sweet Street” – Calle de los Dulces! If you don’t happen to be in Puebla this summer (we wish we were!) check out this Spanish-language video from Pulso to see Molletes for yourself. Cinco de Mayo is actually more widely celebrated in the US than in Mexico, where it is primarily a holiday in the state of Puebla. The Cinco de Mayo holiday celebrates the defeat of the French army by the Mexican army in the Battle of Puebla, on May 5, 1862. So while most Cinco de Mayo restaurant specials in the area involve Margaritas, we decided to put up some tasty Poblano foods. The New York Times called Puebla the “Lyon of Mexico” – known internationally for its fine cuisine. 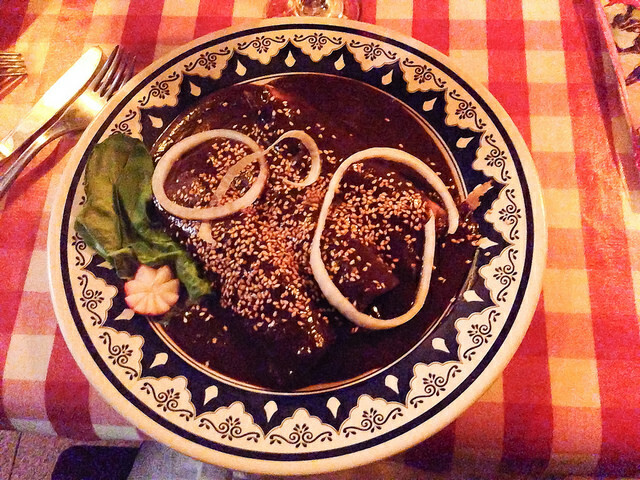 We certainly can’t argue with that, since Puebla has given us some of our favorite dishes like mole poblano. Mole Poblano is usually what people think of when they hear ‘mole’ in the US – the complex spicy sauce made from dried peppers with a hint of chocolate. Chiles en nogada is another archetypal Poblano dish. It’s particularly festive – especially since it is red (pomegranate), green (poblano pepper) and white (walnut sauce), the colors of the Mexican Flag. Elise at Simply recipes has a recipe for this photogenic dish. Epicurious has a few more delicious recipes including a tasty-sounding chicken and potato stew. If you’ve got a hankering for Poblano cuisine and you don’t feel like staying in, you could also head out to Cemitas Puebla (3619 W. North Avenue) for some of the best cemitas (Poblano sandwiches on eggy bread) in Chicago!